Pics and Kicks: Thank You Ohana Video! 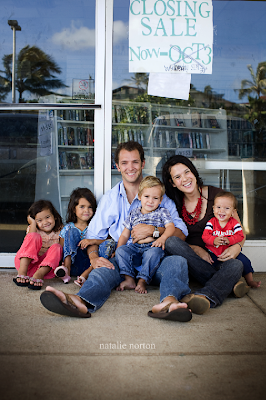 After 7 years of dedicated service to our community, Ohana Video is closing it's doors. :( I was honored when my friend Rachel asked me to take a few pictures of their family on their store's final day. I know closing the store was a bitter sweet decision for our friends and as I culled through the images, I'm not gonna lie, I felt a little tug in my heart that went beyond purely pregnancy related emotions. . . I know I'm not the only one who's sad to see the store go! Jase and Rachel have truly been a pillar in the community for the 6 1/2 years they've owned the store. I know I can speak for the community as a whole when I say THANK YOU Bennett family for loving and entertaining us all these years! Oh wow, Natalie. Awesome pictures. 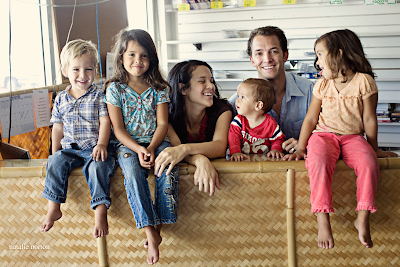 The Bennetts are such a great family and Ohana Video was so good for Laie. Thanks, you guys, for serving us all for so long! Great pics for them to remember the numerous hours there- good and bad! And I know we all have our own family memories thanks to Ohana as well, sad to think it's over. WOW! Seriously amazing and beautiful pictures. So creative! 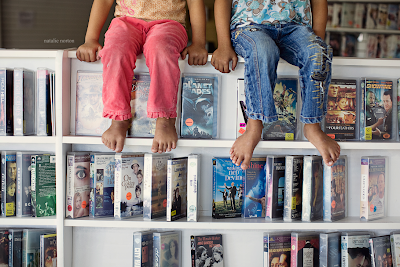 How cool to have pics in a video store...and one you own! I love that you can see the Bennett van in the window's reflection. CLASSIC. Jase and Rach: We love you guys so much. Congrats on all the great changes you are making. YOU ROCK! Job well done -- to all of you! Bigger and better things ahead, I'm sure:) What an absolutely beautiful family. My husband & I spent many nights at Ohana and look forward to going every time we're in town. We're flying back to Hawaii tomorrow for 10 days & I'm so sad it's not going to be open while we're there! Nice pictures! We never used Ohana Video but I know SOO many families are going to miss the store! It was a GREAT alternative to the movies we have! Where are they going to get their edited movies now? Oh no!!!! It's sad they're closing. 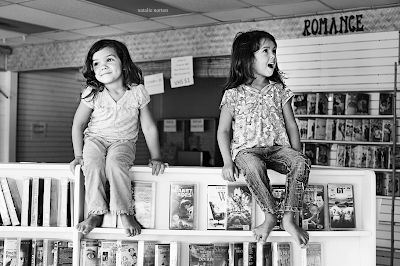 We still remember the many times we went there to get a clean movie, and the atmosphere was always so fun. It will be greatly missed. Can pass our regard to the Bennetts Family from us. So many great photos- the perfect way for them to remember their wonderful store and this phase in their lives! we love the bennetts! This post made me a little teary. 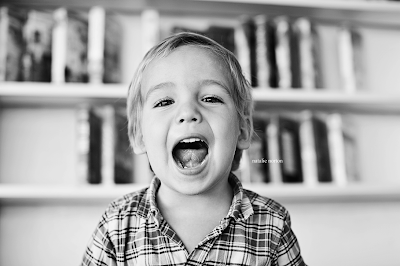 I remember being at the store to choose a video with Rals when he and their oldest were just barely learning to walk!) 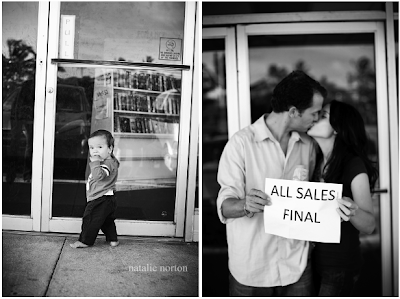 Natalie, you caught some real magic in these shots--I'm so glad that they'll have them to remember their years at O'hana Video as their little family grew and grew and grew. natalie, i agree with annie... real magic. as soon as the photos started popping up i started crying. real tears. i couldn't stop. and i'm not pregnant. thank you for posting these. i miss my brother and his family so much. and it is so fun to see you capture them. great job. thank you. Shanda you are so cute. Your comment made me get a little teary. Tears tears everywhere. I drove by the store yesterday and felt a little glum inside seeing it dark and empty. :( BUT I'm super excited for Jase and Rach to be free to move forward to other things! Stop it! You two made me get teary! ahhhh Girls!!!! Nat you amaze me and are the coolest in the universe for all you do and have done for my lil fam! nat, he doesn't just tell you that. he tells me that you are the coolest. and from what i hear from him, i agree. and i am going to admit this, i am tearing up. again. and yes. Thank you Jase and Rach for all you continue to do for our community..you guys are the best..